Disclosure: I received a complimentary copy of Abandoned Faith: Why Millennials Are Walking Away and How You Can Lead Them Home from Tyndale Blog Network, in exchange for a honest review. 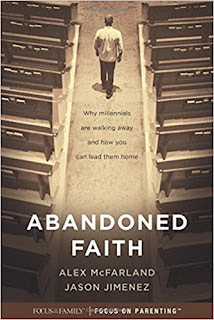 Abandoned Faith: Why Millennials Are Walking Away and How You Can Lead Them Home is an incredible book that I think every parent needs to read, regardless of how old their children are. It is a book designed for parents of Millennials; people born between 1980 and 2000. I felt this book could reach every parent on all levels. It is a Focus on the Family book, and written by both Alex McFarland and Jason Jimenez. These two authors share their research and conversations had with Millennials and their parents, as well as interviews with top Christian leaders who have worked with Millennials and their families. It discusses how children brought up in the church, are walking away from their faith and also the struggles these Millennials face. It discusses the distractions, such as technology, and also what happens when children step away from home for the first time. It is also a book that gives parents of these Millennials, the Millennials themselves, and their families hope. This book was hard to put down. I initially wanted to review it, because I have many friends and family who have either walked away from church or have not had an interest in wanting to attend church. I wanted to know the reasons as to why this would be. This book is extremely honest. It has us as parents, look at ourselves and how we live our lives, and what we model for our children. I am a Millennial since I was born within the dates listed above, and I remember as a child being told, "Do as I say, and not as I do." The problem with this expression is, a child is going to model what their parent does, or go out of their way to not model their behavior. I feel like kids born today, see right through this. If you as a parent do something, they of course are going to model you. This doesn't mean we as parents are supposed to live without breathing or without mistakes, but we need to make life realistic and balanced so that our children can live this way as well. Abandoned Faith addresses much of the guilt that parents beat themselves up over. Many parents may not have been Christians during their child raising years, or maybe struggled with their own issues as they were raising their children. Ultimately, this may have led to their children walking away from the church as an adult. I know this is a big problem in the church and one that is not discussed, but this book sheds light on that and offers hope. It stresses the power and importance of prayer, but also forgiveness. Whether it is forgiving yourself, your parents, or your children, I can't tell you how healing this book was to read. I would definitely recommend this book to any parent, or any church leader. There are so many amazing stories and testimonies, and ideas on how to bring Millennials back to the church. I think the most emphasized way, was modeling Christ in us. It is not just about going to church on Sunday. It is about loving others and staying strong in our faith, and living that out everyday. If we can model that for ourselves, our children, and others, I think we will see many of these Millennials return to church. Disclosure: I received a complimentary copy of The Story Travelers Bible from Tyndale Blog Network, in exchange for a honest review. 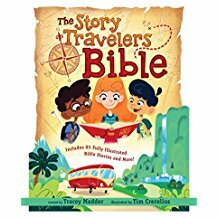 My sons have been loving reading through the adventures in The Story Travelers Bible. There are 85 different stories from the Bible that include learning about the important cultures, people and places of the Bible. It is a fun way to learn the Biblical truths of these stories, and I think a great way to spend time with your kids as a family. The pages are beautifully illustrated, and they include sidebars on historical facts and scripture references. It is recommended for children from four years old to seventh grade. My boys had a blast traveling through these stories with the three fictional children shown on the cover; Lana, Munch and Griffin. My oldest, who will be eight this year enjoyed being able to read some of the stories to my youngest, who will be six this year. They also had an amazing time reading with Grandma. I loved that they were able to spend time together, and have such a good experience reading through these fun and truthful stories. I also really enjoyed the amount of effort and research that went into explaining these Biblical stories, in a way that children could understand. I thought the three children hosts really was a fantastic idea. The children are whisked away in a magical bus, and are able to view the Biblical stories first hand. There is insight into thinking further about what the stories mean, and how they can be related to our own lives today. There is also scripture reference at the end of each story, that encourages you to get into your Bible and read. I have read so many Biblical storybooks throughout the years with my sons, and it was refreshing for the author to encourage not only relying on these stories, but to get into the Bible and further see the truth behind all of the stories. As a Mom and a Sunday School children's teacher, I would highly recommend this Bible storybook. My mother-in-law and both of my boys also highly recommend this Bible storybook. We all had such a fun experience reading this together, and digging further into God's Word. I think it so important to instill the truth of these stories into children, and this book does an incredible job of accomplishing that.